Sean Connery’s James Bond is considered by many to be one of the best-dressed men of film history, alongside Cary Grant, Gary Cooper, Fred Astaire and Steve McQueen. Connery’s Bond style is the essence of what the filmic James Bond’s style is, and it has served as the basis for the styles of all of the James Bond’s that have succeeded him on film. Connery’s Bond style is one that does not stand out in a crowd due to the austerity of the clothes, making him perfectly dressed for a spy. The tremendous appeal of Connery’s Bond style is that it seems so effortlessly simple, but what truly makes the clothes special is not so basic. 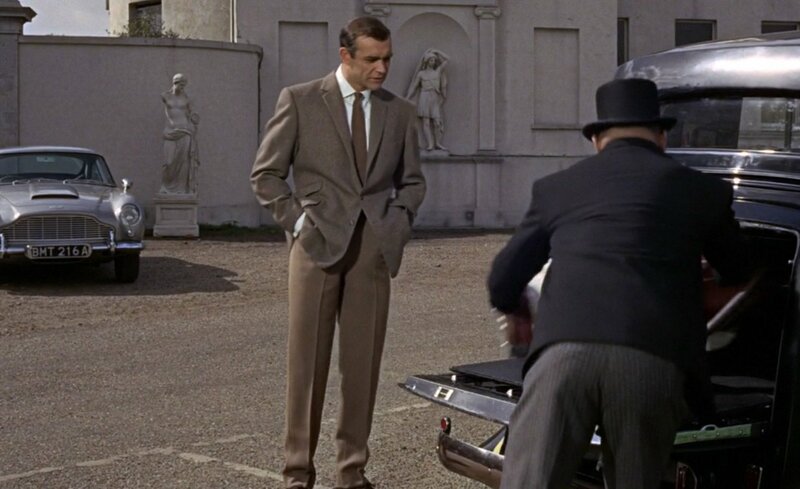 Connery’s Bond style starts with single-breasted suits, dinner suits and odd jackets and trousers tailored in a style known as the “Conduit Cut”. “Conduit Cut” is a term often thrown around when discussing Sean Connery’s James Bond suits made by tailor Anthony Sinclair, and the term comes from Sinclair’s location on Conduit Street in London’s Mayfair district. But what does the term “Conduit Cut” truly mean? After the first impact of the appearance of the cloth, it is the cut that you notice in a good suit. It can do everything from allowing drape and breadth over the chest muscles, which can allow space for a pocket book or handkerchief, to skilfully by-passing a waist slightly thickened with the years and still achieve slim hips. The cut can readily be seen in all parts of a suit’s silhouette, in the jacket from the shape of the shoulders and chest, to the waist and skirt, to the shape of the sleeves, and in the trousers from the depth and length of the pleats, to the curve around the seat, to the shape of the legs. The cut is not only about the silhouette of the suit but also about how the silhouette interacts with one’s body. However, the cut has little to do with the cloths used, though different patterns and types of cloths may need to be cut in slightly different ways. The cut of Anthony Sinclair’s jackets is defined by a low button stance, soft shoulders with roped sleeve heads, a full-cut chest that sometimes has extra fullness on the sides known as drape, and a gently suppressed waist. The cut of Sinclair’s trousers is characterised by a high rise that sits at the waist, a trim—but not tight—fit through the hips and thighs, and legs tapered to a slightly narrow opening. These characteristics hold true for Sinclair’s suits in Sean Connery’s six James Bond films made between 1962 and 1971. 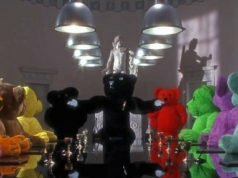 The exact cut is not entirely the same throughout Connery’s tenure as Bond, but the ideas behind the cut are unchanged. The cuts started off fuller in 1962, but by the late 1960s the clothes had a closer fit. The button stance and trouser rise were lowered slightly early on. Jackets have either two buttons or one button, but the essence of the cut remains the same no matter the number of buttons. Forward pleats are present on all suit trousers in the 1960s, but not on odd trousers or on suit trousers in the 1970s. The trousers without pleats had darts in front instead. The trousers, naturally, were cut differently for pleats than they were for darts, but the essence of trousers cuts are the same. Details like the width of the lapels, the style of pockets, the presence or lack of vents, and method of trouser support have less importance on how the cut of a suit is defined. It is the overall silhouette that has the most importance. While the style of Sinclair’s clothing is elegant, it is not meant to draw attention. At first glance the style seems simple, but there are many nuances to Sinclair’s cut that make it the special cut that it is. A ready-to-wear suit that checks off all the boxes can never be quite the same. A suit is defined by more than it’s colour and the number of buttons or vents it has. I make clothes in the classic English tradition. I won’t make exaggerated, flamboyant clothes. I make only a Savile Row style. The only comment I want about my suits is that they are elegant. And I’ve given Connery the same cut I’ve given every customer all my tailoring life. Though Sinclair was located off of Savile Row, and though a number of different styles of suits could be found at different Savile Row tailors, Sinclair wanted to emphasise that his suits followed London’s West End tailoring tradition. I don’t believe in padding … I hate exaggerated styles. Everything should be in proportion. The eye shouldn’t be riveted on very narrow or wide lapels or wide shoulders or anything else–the suit is taken as a whole is the thing. 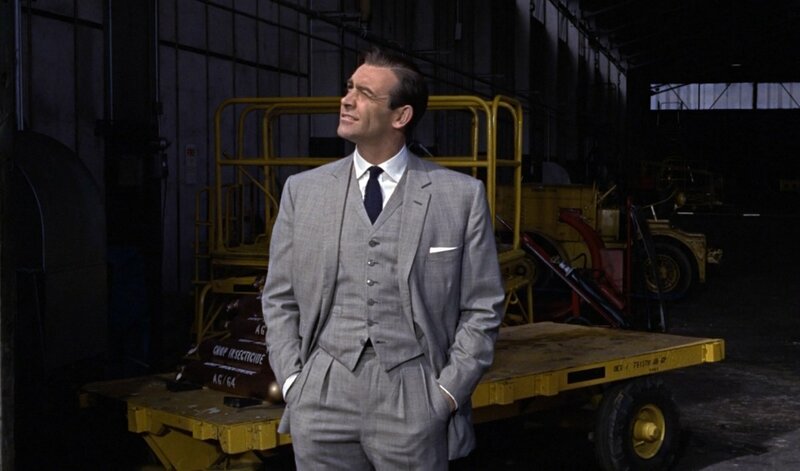 The way Sinclair describes his style of tailoring is the essence of Connery’s James Bond style and is the key part of why his style is still admired today. 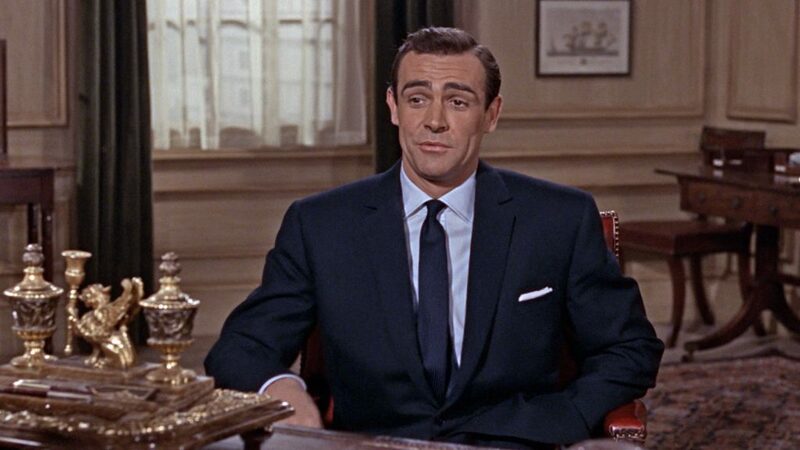 The lapels on Connery’s suits are narrow, but they are not overly narrow by 1960s standards or by today’s standards. 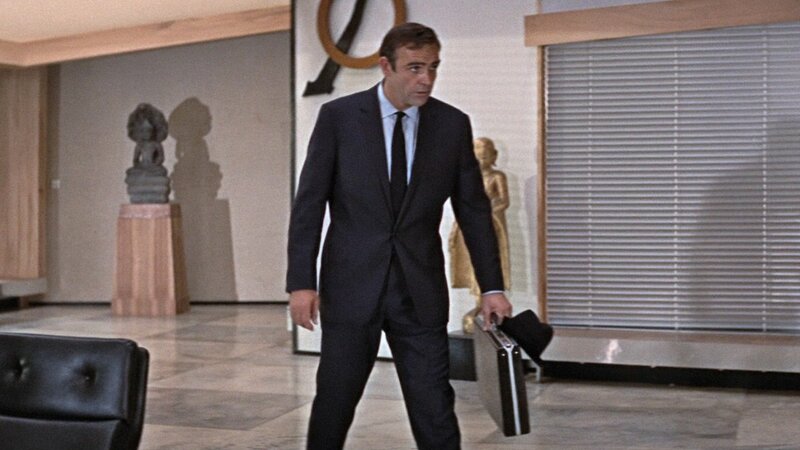 The suits’ shoulders may seem wide, but that’s only because Sean Connery himself had broad shoulders. Nobody is quite sure who coined the term “Conduit Cut”, but it is widely attributable to the tailoring of Anthony Sinclair. I don’t believe it’s a term that he used personally, rather describing his own cutting style as “drape and shape”—which I think is a wonderful expression. Given modern tastes, we are currently producing more “shape” than “drape”, but we discourage tightness … comfort and movement are key elements of our clothing. Sinclair was against heavy padding and rigid construction. Whilst some of his customers, such as Sean Connery and Richard Burton, were hard men, they liked soft suits—particularly Burton who always demanded softness and lightness … and probably more “drape” than “shape”. Mason has a thorough understanding of what the essence of Anthony Sinclair’s tailoring is all about. Though Mason produces a line of ready-to-wear suits under the “Conduit Cut” moniker that are not exact copies of what Sinclair tailored for Sean Connery, they follow the essence of the suits Sinclair made just with modern updates. Mason believe that if Sinclair himself were still making suits today, he would have updated his cut to hint at today’s fashions, just as he updated his cut throughout Connery’s tenure as Bond. How simple is Connery’s Bond style? I suppose my personal view is that the Conduit Cut is really about simplicity, and the classic British style of understated elegance that all began with Beau Brummell over 200 years ago. Ironically, Brummell’s tailor, Jonathan Meyer, was located in Conduit Street from the late 18th century until the 2nd World War when the firm was bombed out of its premises. Brummell famously wore a plain white starched linen stock (or cravat) with his suits, often spending hours working through dozens of them until he’d tied a satisfactory knot. I suppose it is true to say that the simplest things are often the most difficult to perfect. Almost all aspects of Connery’s Bond style follow this idea of wearing clothes that aren’t as simple as they first seem to be. If the clothes seem simple, they need to be perfectly tailored and comfortably worn in order to stand apart as special. Proportions and fit are the most important aspects of a suit, and Anthony Sinclair always got them bang on for Sean Connery. It’s the main reason why people still admire Connery’s clothes over half a century after he first starred as James Bond. A suit needs to both be properly cut for the person wearing it and be properly cut to work as a unified garment. Many of the finer details set also Connery’s Bond suits apart from more typical suits without being readily noticeable. These are subtle facets that usually aren’t given much thought because they do not detract from the simple look of the clothes, but they have a powerful impact on the overall look of the clothes. The waistband of the suit trousers is such an example. It has “Daks tops”-style adjustable tabs on each side of the waist with three smoke mother-of-pearl buttons on each side to elegantly hold up the trousers without a belt or braces. The front of the trousers close with a waistband extension that secures with two hidden hook and eye fasteners. The extension keeps the waistband straight in front, and the lack of a visible button is most elegant and least disruptive. 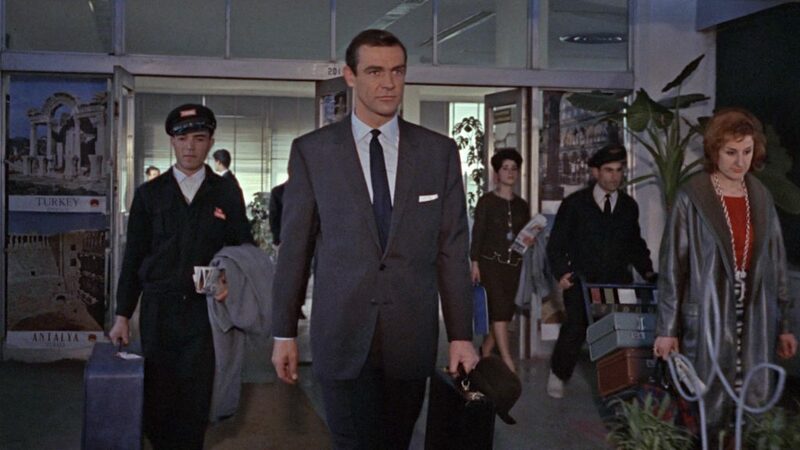 The simple elegance of the “Conduit Cut” is mimicked in all parts of Sean Connery’s James Bond clothes. 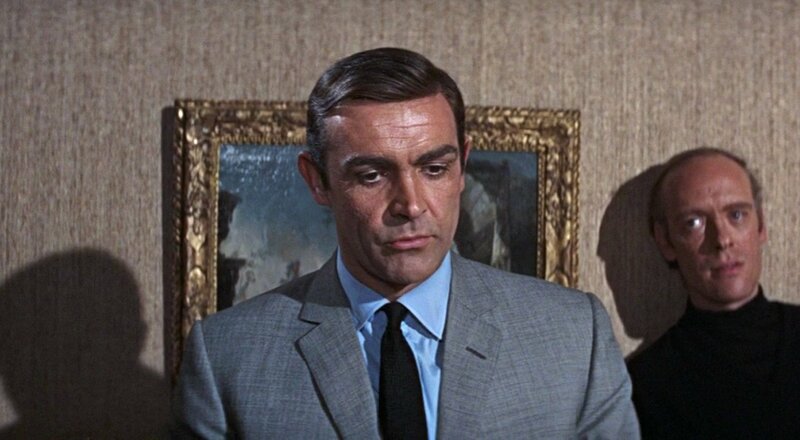 Like the cut of Anthony Sinclair’s suits, the colours and textures of the fabrics Sean Connery wears as James Bond at first seem simple but with a closer look reveal so much more. Sean Connery’s Bond rarely wears flashy patterns or bright colours. His suits are often grey, sometimes blue and occasionally brown. However, the suitings and jacketings that the clothes he wears are made from are far from boring. He wears many grey suits over the course of six James Bond films. There are 16 of them (two more if you add Never Say Never Again), which are over half of the suits he wears. That does not sound very exciting, does it? Connery’s Bond’s love of grey suits would be boring if they were all flat piece-dyed worsteds. Instead there is always some sort of visual texture (except in the rare occasions when he wears chalk stripes). The texture could come from the fuzziness of a woolen flannel, the slubs of dupioni silk or the sheen of a wool and mohair blend. Often the texture comes from weaving multiple shades of grey together in a pick-and-pick (sharkskin), herringbone, plain-weave glen check, hopsack glen check and Glen Urquhart check. Connery wears five different grey suits in From Russia with Love, and even if they were all in the same shade of grey they would all have a texture uniquely of their own. 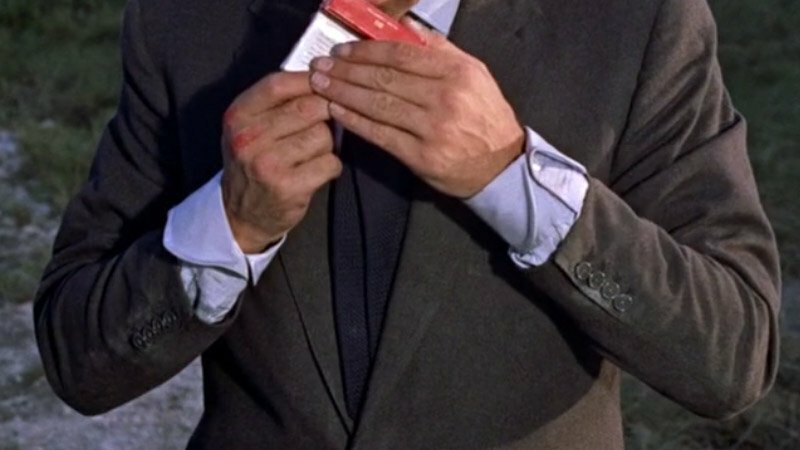 Connery’s Bond style uses the texture approach to the ties’ silks as well. 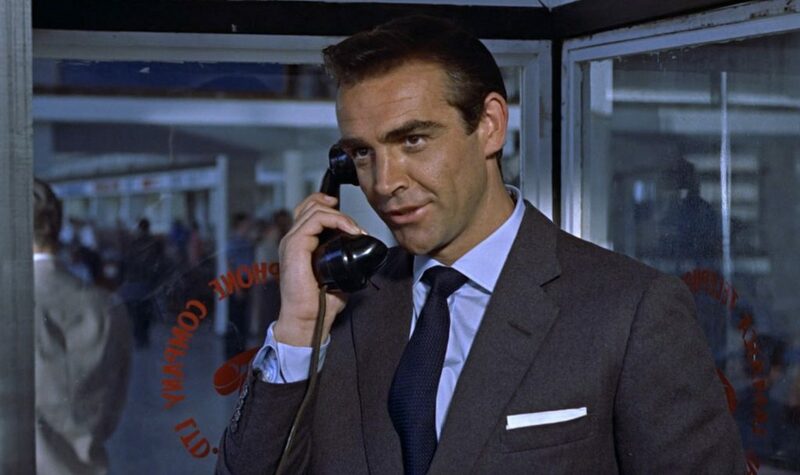 The ties Connery’s Bond wears are almost always solid and in dark colours: navy, dark brown and black. Again, doesn’t that sound boring? It isn’t boring because the ties always have texture. Most of the time the texture comes from luxurious grenadine silk, which has an elegant lace-like appearance. Navy grenadine is his favourite tie, and it could successfully be paired with just about anything he wears. When it’s not grenadine it’s a knitted silk tie or, in Diamonds Are Forever, a fancy ribbed weave. Connery never wears flat solid repp ties (except with his Royal Navy uniform) or the flashy satin ties that Roger Moore is a fan of. The ties never stand out—apart from a pink tie in Diamonds Are Forever—but they are never unimaginative. 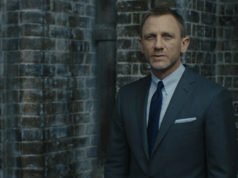 With his understated suits and sober ties, does Connery’s James Bond make a statement with his shirts? Of course not! He sticks with classic light-coloured shirts that draw attention to his face. Usually his shirts are solid light blue and cream, and his shirts in Goldfinger are white and off-white with very subtle grey broken stripes. The collar is always a spread, which balances Connery’s angular jawline. It’s the most basic collar, but when shaped well, properly interfaced for a subtle roll and sized proportionately to the face it can do no wrong. But like everything else that Connery wears as Bond, his shirts are not ordinary. 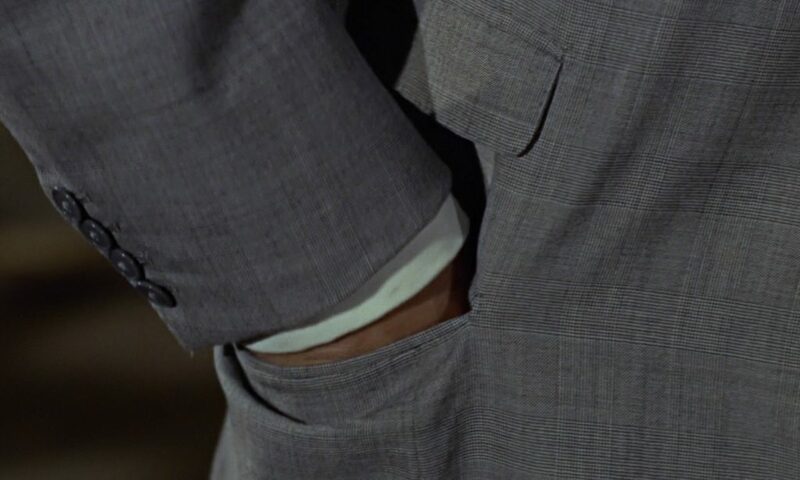 In all of his Bond films with the exception of Goldfinger, the shirts have cocktail cuffs: a type of double cuff that fastens in a barrel fashion with buttons rather than with cufflinks. Cocktail cuffs are the only gimmicky aspect of Connery’s Bond clothing, but they’re the only way he has fun with his shirts. And what fun they are! Cocktail cuffs set Connery’s shirts apart from most other shirts without drawing attention in a way that bright stripes or flashy cufflinks could. People who pay close attention to the clothes will notice the cuffs, but the average person will not. It’s a more sophisticated way to stand out, and screaming isn’t so gentlemanly. Sean Connery wears pocket squares in his first three James Bond films, and they’re always straight-folded white linen handkerchiefs. He does not match his pocket square to his shirt; it is a consistent plain white. The plain white pocket square never distracts and never clashes. It may not be the most fun, but it gets the job done. When Connery wants to have more fun with his pocket square he folds it in a single point, which can be seen in Goldfinger. He’s careful not to go any further with pocket square colours or folds or risk it draw all attention away from the rest of the outfit and himself. The styles of Connery’s shoes have varied more than the styles of any other garments he wears. They include two-eyelet and three-eye derbys in plain-toe, cap-toe and full brouge styles to elastic-sided short ankle boots and shoes, to cap-toe oxfords. The shoes that he wears with suits are almost always black, which keeps with the understated British look of his dress. Simplicity and minimalism is again often the key with Sean Connery’s Bond black tie style. 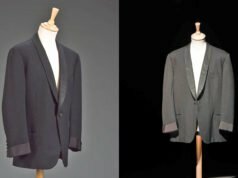 Dinner jackets (Tuxedo jackets) are the traditional single-breasted model with a single button fastening and have shawl collars or peaked or notched lapels. The dress shirts (Tuxedo shirts) are always in the classic soft style with a spread collar and a soft front. 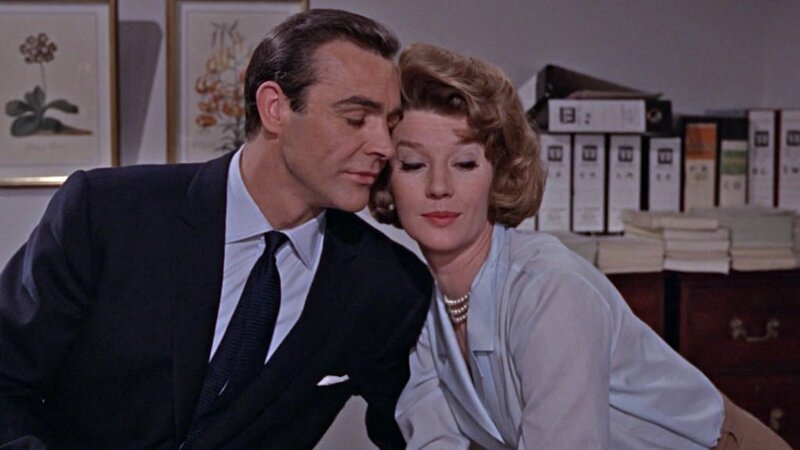 He never wears studs, which both fits with the understated nature of of Connery’s Bond style and with the English manner of wearing soft-fronted shirts. The shirts usually have pleats in the front and double cuffs to take cufflinks, in the traditional fashion. 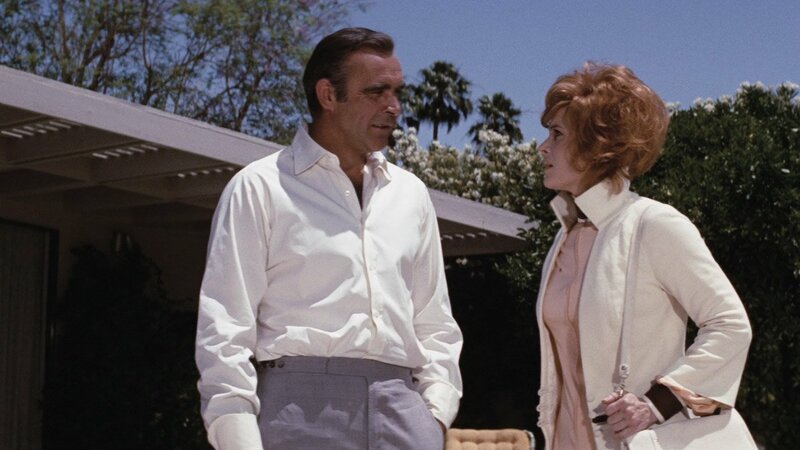 But Thunderball features James Bond in the dress shirt that perfectly fits with the minimalism of Connery Bond style. Instead of a pleated front, the front is completely plain. And in place of the double cuffs are cocktail cuffs to eliminate what Bond might consider unnecessary cufflinks. The shirt is not a plain white but a white-on-white stripe, giving it the interest and fanciness that the pleat-less front lacks. Throughout the 1960s, Connery also never wears any type of waist-covering—neither a cummerbund nor a waistcoat—with black tie. Since the cummerbund and waistcoat should just barely seen with the dinner jacket fastened, and the current trend of a high button stance and low-rise trousers that shows a triangle of white shirt beneath the fastened jacket button was unheard of at the time, the waist-covering is not at all missed. 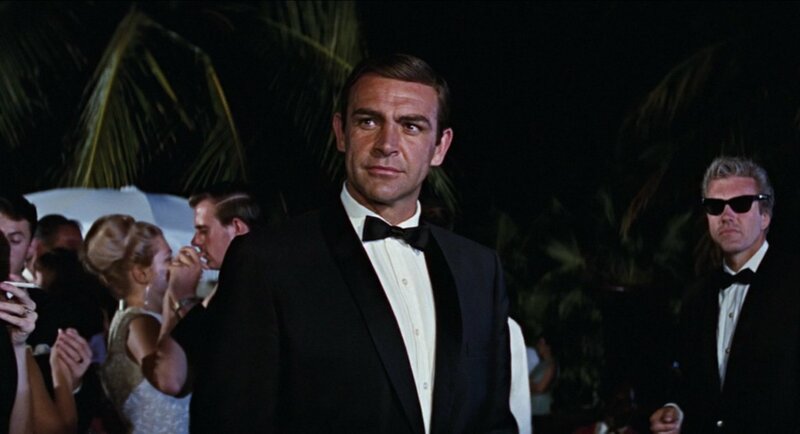 Though Connery’s Bond was not opposed to waistcoats with his suits, the minimalism of no waist-covering with black tie fits in with the basic ideals of Connery’s Bond’s dress. 1. Fit and cut are of the utmost importance. They are the minimum that is necessary to be well-dressed. 2. Get the small things right first. Be aware of not only how the clothes fit but also of how your trousers stay up or how wide and tall your shirt collar is. 3. Subtlety is stylish. Fine patterns and textures can be just as interesting as bigger patterns. 4. Know that what you’re wearing is special. Clothes can be unique without shouting it to the world. 5. Know that you are special. Connery’s Bond dresses for himself and not for his clothes. His clothes are perfect for him, from the fit of his suits to the shape of his shirt collar, because the clothes let him speak and do not overpower his voice. The overall philosophy by which he dresses can work for almost anyone, but not all of the specifics of his clothes may. Connery’s method of dressing is not only way to dress, but dressing simply and dressing spectacularly are two things that are difficult to do at the same time. 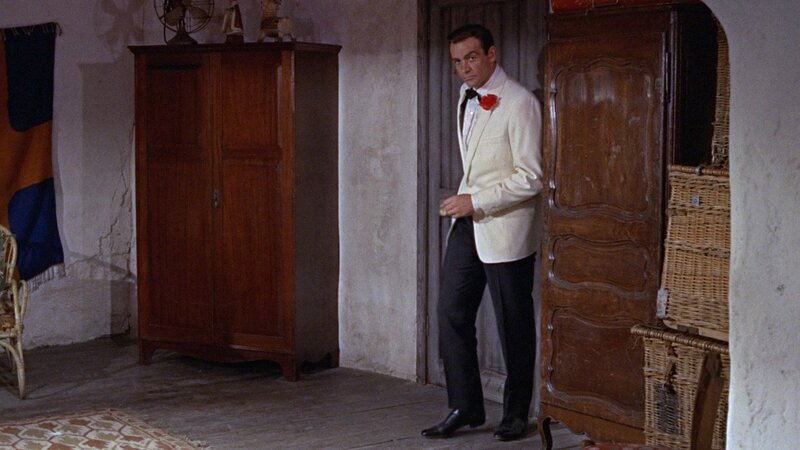 Connery’s Bond mastered how to dress with the most elegant simplicity and does not feel the need to go beyond because there is so much fun and pleasure hidden within his clothes. This is one of your finest articles yet because it contains in a nutshell everything what Bond style is (and should be) about. It’s definite. And Connery as Bond will remain the epitome of style forever! -I imploringly wish that people like Temime would take a leaf or two out of Sinclair’s book! Very nice articel indeed Matt. Not only very informative but the writing conveys a love for classic men’s clothing and elegant understated style that I find very inspiring. You article respond from a Bond point of view on what is a “clean cut”. What i dislike of current bespoke suits is the lack of sobriety. While the ready to wear clothes are awful for the tight-short-skimpy look,the bespoke are too often showy,flamboyant,sliced (look at the Pitti Uomo circus,or at the pictures on the clothing forum). A lot of big patterns and flashy colours, and “pattern on pattern on pattern of suits,ties and shirts. The model seems to be a Duke of Windsor gone mad! What i regret of early-mid 60s is the elegant cleanliness of cut and style….very very rare today. Great article! How can a suit shoulder be both “soft” and have a “roped sleeve head” at the same time? Is the roping is made with a soft material? The shoulder of the body of the jacket is made soft without padding. The roping is in the sleeve. 1. Will you be looking at the style of the other bonds in this much detail, or no? 2. Have you ever considered compiling your blog into book format? 1. I have looked at the styles of all the Bonds in great detail, but in different ways. This article doesn’t actually focus on details but an overall concept of dressing. 2. I have considered a book, but if I do make a book it’s a long way off. This article feels more like an overview of Connerys’ general style as James Bond. Will you do something similar for Lazenby, Moore and so on? I could do it for Lazenby and Brosnan. The others have multiple approaches to dressing that would make such an article impossible. It is hard to go past Connery’s style in his Bond films. The great cut of his suits by Anthony Sinclair and the unique Turnball and Asser shirts (with some made by the legend Frank Foster also). A lot of his suits and odd jackets are very timeless, especially when compared to Roger Moore’s 1970’s before he went to the simple elegance of Douglas Hayward. thanks for yet another great articles. I would like to learn a little bit more about drape. It would be very nice if you could elaborate more on examples of good drape vs no, or little drape. how it is applied to a suit’s fit. Does it only depend on the fabric, or does also cut play a big rol in this. Brilliant article. It makes me finally understand the one gripe I always had with the Conduit cut, the overall softness. The suits look great on Connery thanks to his physique, but mine is closer to Brosnan’s very slim body so the style has never appealed to me. I’ve always loved Connery’s dinner suits more than his lounge suits and only now do I realise it has to do with the weight of the cloth. I far more enjoy the way a heavier cloth sits and drapes than a lightweight one. Now, all this said, I have enormous respect for Sinclair’s tailoring philosophy and I have every intention of noting this down and using in my own future in the tailoring industry. I agree with everything he says, I would personally just apply it a little differently on a practical level. I have to agree with the praise above – I have followed your blog since almost its beginning, and I think this is your finest article. I particularly like the sentence, “Connery’s Bond dresses for himself and not for his clothes.” Hoping to NOT start a 50-comment war, I have sometime felt the last two Bonds had this sentence reversed. No disagreement here. The clothing had zero excuse to fit as badly as it did. I have written you an extensive message on my experience on the drape cut in your “contact” inbox. Can you please check? Connery certainly showed us all the possible variations on the simple grey suit/light blue shirt/navy tie combination. The quasi-monochromatic country outfit in GF is also a classic. Some of his navy suit/navy tie outfits, on the other hand, don’t quite work and are, frankly, a little boring. The brown outfit in the office scene in TB is also forgettable. On balance, however, the “Connery look” is unmistakable in its spare, no-nonsense masculinity. Country outfit: I find the TB variation of this outfit even a bit superior to the GF one. Matt, I’ve read every article on your blog, most of them multiple times, and this is up there with the best. Although I like elements from all of the Bonds’ tailored wardrobes, I always find myself coming back to the simple elegance of Connery’s style. Some might say that the color palette is boring, but I think it’s the best feature! It looks good in any era, paired with any complexion, on a man of any age. If that’s not the definition of timeless style, I don’t know what it. Matt, i’d love to see an article featuring Lazenby and Brosnan in a similar vain to this. Great, I still really love how Brosnan dressed as Bond, he was a big influence on how I dressed in the early 2000’s. His Bond looks and Thomas Crown looks really helped evolve my personal style. Of course Connery’s Bond was always there for me too. Have you ever considered doing an article about the suits of John F. Kennedy? Kennedy’s love of Bond isn’t quite enough for me to write about him here. What about Steve McQueen’s suits in the original version of the Thomas Crown Affair ? Another blog has already written about those suits. do you think you can do an article of Terence young who apparently began the Connery 007 style? I’m curious to see what his thoughts were and how much of himself was in bond. Again if it’s outside the scope I sincerely do understand. I myself tried to emulate the navy blazer with the Grey trousers he wore in this film but my cutter and I both agreed I looked like a security guard. What a ridiculous thought. There’s nothing “security guard” about a navy blazer and grey flannels which are well cut and I wish the internet menswear community would stop bandying about such falsehoods. Not attacking you, but whoever first put the idea in your head! I think it’s because I was overweight at the time. Thank you so much for your cander. Self improvement never comes from a lie, this is the reason why I have had the same cutter for over 15 years. I’m thinking about getting a special navy sinclair suit, do you think it’s possible to just to purchase an additional jacket and just have the buttons changed to make it into a blazer? Sure, if it’s a solid navy serge jacket you can make it into a blazer with different buttons. But if you’re going for special order you should get swelled edges. They also sell a Connery-style blazer. The pockets are all patch pockets. You mentioned how the collar is perfect for Connery’s face. I must admit I really have trouble finding the collar that suits me. That being said, you saw my face, what collar would be best for me? I think you’d look best in a moderate spread collar. A moderate spread collar would be like the regent from turnbull asser correct? No, the Regent is a wide spread. You need something like Turnbull & Asser’s classic spread or, ideally, a bit narrower. I usually wear tall collared shirts like the ones Sir Roger wears in 007 films. To me, I really do not like it when the suit overrides the collar from the back. The tall collar gives me that security plus in addition I also think it looks more elegant, hence the fact I asked you about the collar pierce brosnan wore in TWINE. Do you think I should cut back on the height of the collar? Or does it really matter? I do not fancy walking around like Karl Lagerfeld, his collars look like a neck brace. You can wear tall collars if your neck is long enough. When it came to buying a suit, what’s the worst suit you ever bought? What’s the best suit in your closet right now? The worst suit I ever bought was an After Six dinner suit for my high school prom. It was cheap and a size too large. The best suit in my closet right now is the blue Anthony Sinclair suit I have. It is my newest and best-fitting suit. The regent collar is my favorite style, Daniel Craig really should be wearing a spread or cutaway collar. It would really flatter his jawline. I wonder why the costume designer never puts him in one ?, Matt may have an idea. I can’t figure out why Jany Temime hasn’t put Bond in a spread collar. There are so many reasons to, and no reasons for her other choices, other than her personal preferences. I am an avid fan of your articles, which provide intricate details of James Bond’s suits. I would hate to trouble you but, i was wondering if you could draw a comparison between Mr. Connery’s Conduit cut and the O’Connell cut made by Tom Ford for Mr. Craig? Many tailors will not be able to replicate the Conduit Cut. Mason & Sons does it very well. I’ve seen great examples from Davies & Sons on Savile Row and from some tailors in Japan. Especially since it’s very different from the cuts tailors usually do now, it will be difficult to find a tailor who can do it.